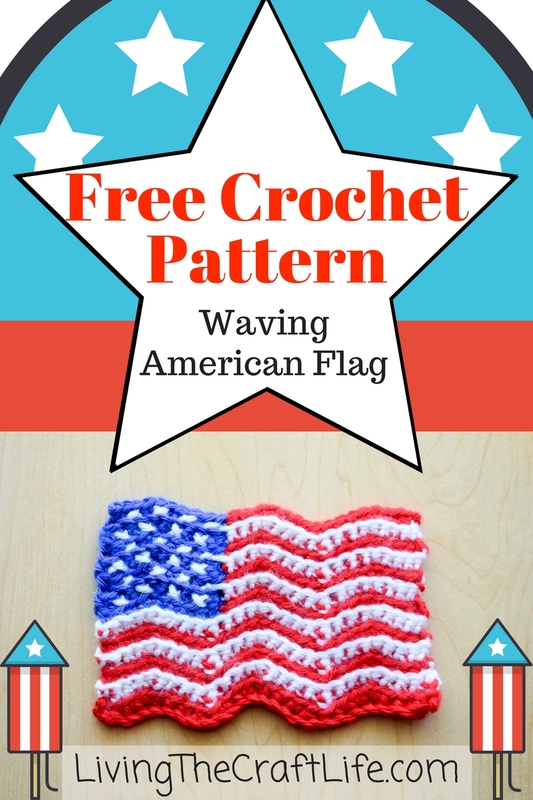 This year I wanted to create a cute, patriotic pattern to celebrate the 4th of July. After looking at some patterns that were already out there, I decided on this concept of a waving flag, not just the flat, motionless two dimensional flag. I wanted to give it some texture and some life! So here is the pattern I came up with! With materials listed the flag will end up being about 6" x 4"
SC2TOG: insert the hook into the first stitch, yarn over, and draw the yarn through the stitch, insert the hook into the second stitch, yarn over, and draw the yarn through the stitch, then yarn over, and draw through the three loops on the hook. COLOR CHANGES: The American flag alternates between red and white rows. I have written the pattern so that you do not have to cut the blue yarn between each row. Before attaching the new color, take the end of the blue yarn and put it to the back. This way it will be ready where it needs to be when you are ready to pick it up again. ROW 1 TIP: If you want to make the bottom row of red not as large as the rest, try doing your single crochet stitches in the top two loops of the foundation chain. Row 7: in RED, ch 1, Working in the back loops only, sc2tog in the first two stitches, 1 sc in the next two sts, 2 sc in the next st, 1 sc in next 3 sts, sc2tog, 1 sc in next 3 sts, 2 sc in the next st, 1 sc in the next 2 sts, then COLOR CHANGE TO BLUE, 1 sc in next st, sc2tog, 1 sc in next 3 sts, 2 sc in the next st, 1 sc in the next 3 stitches. Fasten off, and weave in all the ends. 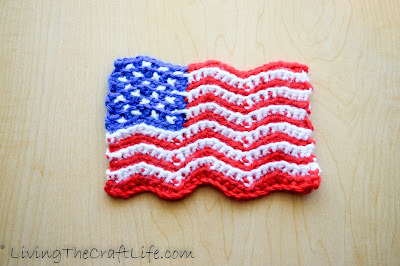 With WHITE, use a sewing needle to stitch any number of stars you want onto the blue portion of the flag. I used cross stitching techniques to put x's on every other single crochet stitch in the blue section, and staggered the rows. Attach the applique to any bag, outfit, or decor to give it a patriotic flair! I have recently learnt weaving and like to try various techniques. This post looks so amazing and I just can't wait to weave this myself. Thank you for guiding so well.